20 inch 8 Tooth HOT ROD KIT for MS261. Everything needed to make your small STIHL become a MONSTER SAW. Extra chains see items 272172017177 yellow label and item 360521514468 green label. 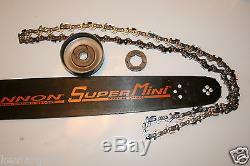 Bar + PS chain + Oregon 0100791 clutch drum + 8 tooth PILTZ Rocket Rim Sprocket sized as Oregon SMALL Spline. Installs in seconds, no special skills or tools required. It will fit anything between the numbers ms260-ms460 if you make sure to tell me what model your saw is, otherwise it will default to MS261. We don't recommend this kit for saws larger than the Stihl MS362, it will fit but the chain is a bit light for the bigger saws and might give you trouble on anything over MS362 size. This kit gives you everything needed to make your saw fly, it will convert your saw regardless of current bar and chain gauge to run 3/8. 050 gauge bar and chain and allow you to change tooth size. It will upgrade your paddle wheel sprocket to a rim drive system. "Designed For racing only not homeowner use" Do not rev the motor without a load it's very hard on bar tips. NO saw NO chain just the bar. From formulated, cold rolled, annealed, heat treated, surface ground, and stress relieved steel. This provides the best possible characteristics of wear resistance, strength, durability, straightness and elasticity. The Cannon Superbar power plus profile maximizes cutting power and chain speed while reducing damage from loose chain. A precision ground groove to within. Each groove is individually centered for even rail wear and superior durability. This increases rail strength and reduces damage from pinches. Also, if the chain rides exactly square to the rail, the result is smoother and straighter cutting. Milling marks, commonly found in the competitions bars, are eliminated. Thus, the groove is tighter and sloppy chain travel occurs much less. The old saying "You get what you pay for" certainly pertains to the Superbar. All Superbars are skillfully handmade and put through rigorous quality assurance checks prior to packaging. Subsequently, the Superbar has a lifetime of up to three times longer than the competitions mass-produced bar. This equates to an enormous 61% savings! Doing that is against U. Please see our other ads for: LINEMAN TREE CLIMBING POLE GAFFS, HOOKS, SPIKES, BELTS by BASHLIN, BUCKINGHAM, KLEIN, WEAVER and others. I also have several CMI pulleys and other climbing items. You cannot do anything to your address that's makes it unreadable to the computer. You also can NOT use more than 26 letters or symbols in your name or street name. You are the only person that can adjust your address; it is part of the security that makes e-commerce possible. The item "Piltz 20 inch 8 Tooth HOT ROD KIT Conversion Kit fits MS261 MS390" is in sale since Friday, November 15, 2013. This item is in the category "Home & Garden\Yard, Garden & Outdoor Living\Outdoor Power Equipment\Chainsaw Parts & Accs". The seller is "kevlargaffs" and is located in Portland, Oregon. This item can be shipped worldwide.